Shane Greene just had a nice start the other day against the Pirates. He didn’t throw a changeup. He didn’t even throw a curve, according to one pitch-type algorithm. It was all fastballs and… well… breaking balls? Greene features a cutter and a slider, but where one begins and the other ends is tough to decide. Let’s take a look at all of his non-fastballs from Wednesday, graphed by horizontal and vertical movement and velocity. Maybe you can see two pitches, even if one system saw three. Then flip the tab to see all of his breaking balls over his career. Now how many pitches do you see? I think the case could be made for four in the career tab. There’s the 90-plus cutter centered somewhere around +2 inches (horizontal) and +6 inches (vertical), something softer in the high 80s centered around +4 and +4, what you might call a slider in the mid-80s centered around +6 and +1, and then I guess a curve out there at +8 and 0 in the mid-70s. Buy your favorite pitch algorithm a drink because this is tough work. We have fancier tools now! Spin rate! Spin direction! They won’t help much in this situation. Greene still threw some harder breaking balls with less spin, and some with more spin. You’d think maybe he didn’t have great feeling in his fingers yet, except it looks like he does it on purpose. Let’s use our eyeballs. Here are two pitches with similar velocities but different spin rates, directions, and movements. You’d round all of these pitches to 91 mph, but their spin rates vary from 714 to 170 and directions from 121 to 171. They were all labeled sliders in PITCHF/x and cutters at Brooks Baseball, and they are all from the first inning of Wednesday’s game. They’re all cutters, you might be saying with a shrug. Except that last one to Polanco (on the far right) dropped four inches more than the one to Jaso (on the far left). And the one to Freese (in the middle) had four inches less glove-side cut as the one to Jaso. They can all still be cutters, sure. But for his career, Greene’s “cutter” has three inches more drop and two inches more run than the average right-hander’s cutter. So it’s already a weird pitch on average, and that is before he starts to manipulate it from batter to batter and pitch to pitch. It’s something I’ve been hearing recently, that the slider is a “feel” pitch. Collin McHugh lamented the loss of feel on his slider to me last year. Zack Greinke talked about losing the slider and cutter to some sort of hybrid two years ago. Oakland reliever Ryan Dull laughed with me about not knowing what a slider was anyway, and then talked about manipulating the release point and pressure on his fingers in order to feel his way through a few different versions of his slider. Luke Gregerson is the godfather of the feel slider. We’ve always thought of the changeup as the feel pitch, or at least that’s what a person learning a changeup might say. But look at the spin rates and velocities of the various pitch types, thanks to Mike Petriello, and it’s the breaking balls that have the widest diameters. You can barely see the changeups hiding there behind the curves and sliders. To tie this all into a ball that might be meaningful in any way is difficult. Shane Greene was probably better on Wednesday because he was throwing 95 and could feel his fingers again. But that feel in his fingertips — which was failing him before nerve surgery — helped him manipulate his best pitch or pitches. And it’s that part of Greene’s struggle that is universal. 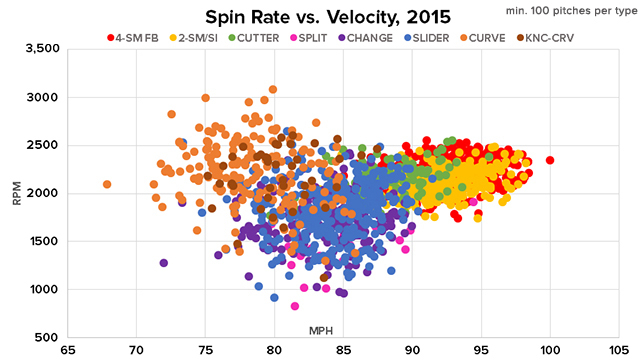 The slider and cutter and curve are some of the most nebulous pitches in baseball, with the largest variety of movements and spins and velocities. The breaking ball truly is a feel pitch, and it might be as many as four or five feel pitches. When Max Marchi did his infamous Platoon Splits 2.0 article, he broke breaking pitches up into five categories — cutter, slider, tight curve, slurve, roundhouse curve. Each “pitch” moves slightly differently, and we might even be able to add a “clutter” or “slutter” in between cutter and slider, if Greene is any guide. Each pitch had a distinctly different platoon split! So when we talk about a fastball/slider guy not being able to handle lefties, we are perhaps being too imprecise. A better approach might be to look at the concentration of their breaking-ball movements, and look for more pitch types hidden within those heat maps. Because, in the case of a pitcher like Greene, it seems way too dismissive to call him a fastball/breaking-ball guy. Sure, except he has four breaking balls. We hoped you liked reading “What Is a Slider, Anyway?” Featuring Shane Greene by Eno Sarris! Does anybody love anybody, anyway?